Salvation And Survival: Want To Know How Easy It's Been To Implement The "Beast System"? Want To Know How Easy It's Been To Implement The "Beast System"? This may seem like old news, but I think that's only because we've become so comfortable with the progress of this agenda, that we don't see it for what it is. Even if you're not a Christian, our culture is aware of the prophetic warnings in the Bible's Book of Revelation that a Mark of the Beast will be forced upon mankind at the end of this world. I would say that secularists and nonbelievers are well aware of the imagery of Good and Evil, and would suggest that the Book of Revelation has been applied throughout history as a political tract, so to speak, to resist tyranny (beginning with the tyranny of Rome as experienced by the Apostle John when he wrote the Book). Articles on the PBS website suggest that when the end did not come in John's time, the central message of the Book has been applied down throughout the ages to all tyrants, without the end coming. In fact, I have read various theses that suggest John was predicting events, basically down to the time of Constantine and nothing beyond, except for an expectation of the end of the world. And again, those who give no Divine perspective to the Bible or the Book of Revelation will say that it's primary message is that the powers of this world, no matter how terrifying they may be, are passing away and that in the end righteousness and justice will prevail. But those of us whose spirits know God's Truth discern that the Book of Revelation, and the "Beast System" it forecasts, are very real and will certainly come to pass. We inherently know that the technological age is moving us in that direction, and I'd like to show you just how easily we've been led down that path. An excellent article on the website PatriotTruther.com spells it out rather concisely. The first step was Cash Alternatives. How many of you are old relics, like me, who prefer to still pay their bills by paper checks? How many Americans now use only credit cards or debit cards for their purchases? Although various charge cards have been around since the 1920s, it wasn't until 1958 that Bank of America launched the first successful recognizably modern credit card. And by the 1970s debit cards were in use, providing the cardholder electronic access to their bank account(s) at a financial institution. The use of cash was declining. Step two was the Digital Payroll. I don't know about you, but I remember being very uncomfortable with not being able to physically see my compensation for a week's work. I instinctively did not like having that control being taken away from me, and intuitively sensed that we had lost a modicum of our freedom. That move has taken us to the current step, a Reduction in Cash Usage. People just don't transact business in cash like they used to. In fact, it is discouraged. We store our credit card info online and buy directly from the seller with a just a few keystrokes. And merchants want you to sign up for "paperless" payments, while devices like Square have made it possible for people to process payments on their smartphone, PC, or tablet. And some banks are even offering their customers the ability to transfer cash to other customers at the same bank. How many of you have experienced the displeasure of a store clerk when you want to write a check, or (Gasp!) actually pay in Cash, rather than use a credit or debit cards? You would think the few extra minutes it takes them to process your payment-for-goods was the most painful experience they've ever had! This will all lead to the next-to-last step of Phasing Out Cash. We're already starting to see that happen. The current monetary system is in imminent collapse, and the powers-that-be are spreading all kinds of information about identity theft and fraud... all for the purpose of introducing the new nationwide shift to EMV chip technology in our credit cards. 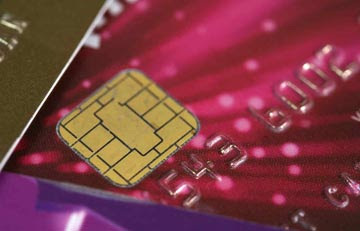 EMV stands for Europay, MasterCard and Visa, and it is a global standard for cards equipped with computer chips and the technology used to authenticate chip-card transactions. Are you starting to see where this is headed in relation to the Book of Revelation? I know I don't need to tell those of you who are awake where this step is taking us. Although the EMV card has been touted as a way to avoid theft and fraud, the truth is that cards are still being stolen and duplicated. And we are told that they are a convenient way to compile all our information in one place; our I.D., medical records, and personal information will be under the protective umbrella of this new technology. Riiiiight! So what is the next logical step? Of course, we must Eliminate Fraud. 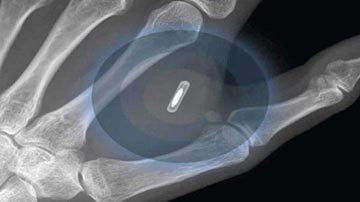 There will soon be a narrative released that theft, fraud, and duplication are not being reduced with the EMV chip in the card, so it only makes sense to implant the chip in us! And you want to hear something interesting? The April 27, 1998, edition of Time Magazine ran a story, The Big Bank Theory And What It Says About The Future OF Money, in which they opined "Your daughter can store the money any way she wants--on her laptop, on a debit card, even (in the not too distant future) on a chip implanted under her skin." And I have read numerous articles that suggested that the most convenient place for the implant would be either the “right” hand, or the forehead. Think that's a coincidence? Now, we know that we cannot change what is coming right? But we certainly have the opportunity to make a difference in the lives of individuals. We must talk to our kids and grandkids, and make them listen to us. This "Beast System" might be inevitable, but it does not mean that we must succumb to it. Please warn others within your sphere of influence that there will soon come a point at which they must make a very important decision; one that will effect their lives for eternity. Currently, that choice seems to be a foregone conclusion, and definitely one of convenience. But we always have a choice... we don't have to be like sheep being led to the slaughter. Revelation 14:11 "And the smoke of their torment goes up forever and ever, and they have no rest, day or night, these worshipers of the beast and its image, and whoever receives the mark of its name."